I'm not much of a dancer. I don't mind it necessarily, but there has to be a perfect storm of excellent tunes and copious amounts of alcohol to really get me going. Every now and then there is a rare exception to that rule. Enter Bullied By Strings. The local electro-dance duo's manic stage show was hot from the start, replete with vociferous percussion, sugary vocals and solid, throbbing beats. Kristen Rowland, the tandem's gold-sequined singer, is profoundly captivating on stage. During some numbers her vocals soar over the thumping, electronic gale force buzz to inject a giddy nonchalance her audience seems more than happy to anchor to. Her movements onstage run the gamut from Karen O burlesque to Dave Chappelle-ian robot shtick. 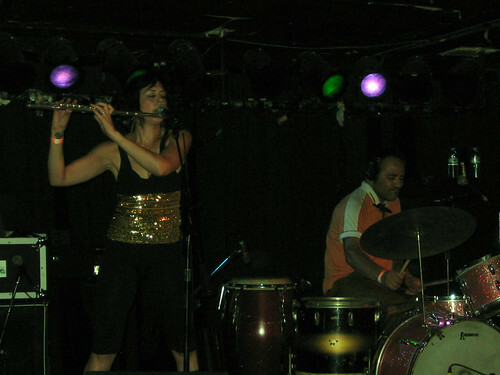 Oh, and then she breaks out a flute and pipes away until you forget that the instrument isn't exactly a staple of booty-shaking pop. Everything is held together by Gabriel Rowland, a wolverine of a drummer skilled enough to dismantle and reassemble the tunes in front of the audience without ever drifting into undanceable territory. All of this came together during a song that began with Gabriel fluttering over congas behind a synth pulse while Kristen told secrets into the microphone. Eventually the number Jiffy Popped into a dance party while the singer wailed on her flute. Not content with simply getting the crowd to strut and sway, BBS opted to see how tightly everyone's head was anchored to their respective necks. The tune, I believe called "Unnecessarily Rude," played out like a disco Rage Against the Machine cover, complete with sizable crunch and a fist-pumping, head-banging chorus. Gabriel bore into his kit like he was trying to crumble SubT's balcony while Kristen straddled the mic stand ala Steven Tyler. Bullied By Strings left the stage to an absolutely explosive round of applause that continued well after they'd vanished. Not bad for the openers. I'd assume the other bands on the bill aren't to eager to follow BBS any time soon, but everyone in attendance has got to be ravenous for another chance to see them. Any band that touts "our live show will kill your lawn" is bound to receive their share of arms-crossed skepticism, but in this case it's true. My lawn is dead now and I live in Portage Park, miles away from the origin of the slaphappy madness. Los Angeles misses Bullied By Strings, but at least I got to read your awesome review!